Dioscorea Linn., Sp. Pl. 1037. 1753. Gen. P1. ed. 5:456. 1754; Hook. f., Fl. Brit. Ind. 6:288. 1892; Collett, Fl. Siml. 518.1902; Knuth, Pflanzenr. Dioscor. 45.1924; Prain & Burkill in Ann. Roy. Bot. Gard. Calcutta, 14.1936-39; Parker, For. Fl. Punj. ed. 3.514.1956. Large perennial herbs with twining annual stems arising from tubers. Leaves alternate or opposite, simple or palmately compound, cordate-sagittate or hastate, multicostate with reticulate and divergent venation, often bearing bulbils in their axils; petioles long, twisted at the base. Flowers small, in spikes or racemes, unisexual, actinomorphic. Male flowers: perianth 6-cleft; segments short, spreading, in 2 whorls; stamens 6, all antheriferous or some times only 3 bearing anthers; filaments free or united at the base, anthers small, incurved, 2-celled, dehiscing longitudinally; pistillode thick and fleshy or absent. 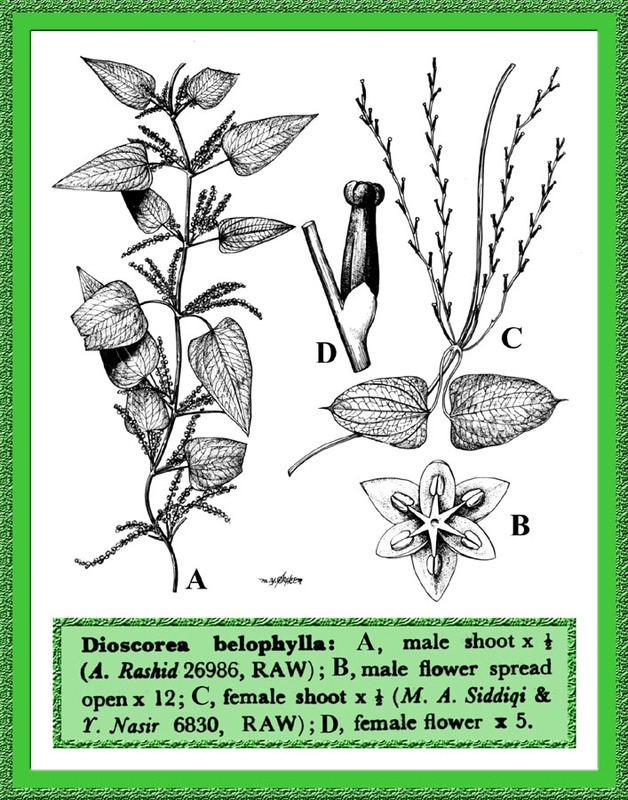 Female flowers: perianth of 6, small, free, persistent tepas; staminodes 6,3 or absent; ovary inferior, 3-quetrous, trilocular, 2 superposed ovules suspended from axile placentas in each locule; stigmas reflexed. Fruit a 3-winged loculicidal capsule. Seeds flattened, often winged. A genus of about 600 species, found in tropical and sub-tropical regions of the world: The stem-tubers or tuberous rhizomes of many species, known as “Yams”, mostly contain starch and are therefore cultivated for food in tropical regions of the world, especially of America. They can be propagated easily either by the bulbils present in the axils of the leaves or by `Eyes' as in potatoes. Represented in Pakistan by 4 species. Dioscorea sativa auct. non Linn. : Hook. f. = Dioscorea bulbifera Linn.